What if books could talk? I'm not talking audio books here, but pulp and ink, hold in your hands physical books. With the ever increasing popularity of the internet one might think that print is dead, but I am here to tell you that it is nowhere near being put in a pine box. I have to admit I am a bit of a bibliophile when it come to automotive books. My love for ink on paper lies between vintage vehicle repair manuals and collector car reference books, but just about anything automotive gets my attention. I was lucky enough to score a first edition Motor's Manual recently in almost perfect condition. Because books are so physical I think they have more meaning then something you would read electronically. Case in point, addressing a book to someone or writing a personal greeting in it. I usually check the inner flap of books that I am interested in and occasionally there will be something written in there. What a person has written can really make you stop and think. Was this someone's favorite book or a gift? Did the owner pass away and it was donated? Were they even aware that something was written in it? These personalized words are pieces of a puzzle that will never be completed but they were all somebody's property at one time and obviously meant something to them. If that book could talk, what would it say? When I bought my current project vehicle, a '56 Chevy I refer to as "Time Warp", the story I got was that it had been sitting for decades. From the minimal information that I received, it went something like this: original owner passes away, car is left as-is in a garage for decades, nobody in the family wants it, wife finally decided to sell it. I knew it had a back story and I wanted to find out what it was. People make a lot of memories with their cars and they don't always sell them because they want to. Have you ever wondered if your classic ride was somebody's wedding car? Maybe it transported a significant other to the hospital for the birth of their first child? Was it someone's dream car or perhaps their very first vehicle? There are many possibilities but one thing remains constant - they were part of someones life. 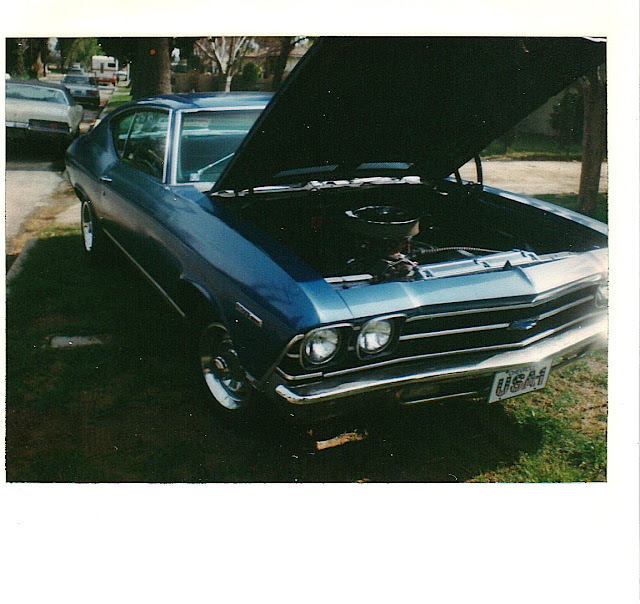 I can vividly remember my blue 1969 Chevelle Malibu, almost every detail of it. One constant memory of this car was right after I had installed a radical 396 big block in it. It was during the summer and I had just got the swap completed on a Saturday evening. In my haste to get it on the road I just bolted some mufflers right to the header collectors. This big block sounded loud and wicked! What better way to test it then to go cruising, so that is exactly what I did. My Chevelle also had a pretty decent sound system and I will never forget the song that I had blasting over my stereo when I made the right turn to get into the Gemco parking lot where everyone was hanging out. The song was Working For The Weekend by Loverboy and every time I hear it, it takes me back to that evening. Isn't it funny how music can do that by triggering our memories and transport us back in time? Music and memories go hand in hand, some happy and some sad. Sometimes though, it is just the vehicle that triggers your memories, no song required. Case in point for me was one late summer evening around 1991. I am leaving work at the auto parts store and as I am walking out into the parking lot, I see this beautiful blond that I had recently met sitting on my car's fender waiting for me. Although I did not know it at the time, the gorgeous gal marring my Chevelle's paint finish would soon become my wife. I wish I knew more of the story on my '56 Chevy. I did find out that it was the car that the previous owner's daughter had learned to drive a stick shift in. That's always a cool memory for our generation and I am sure she remembers it well. Do you remember what vehicle you learned to operate a clutch in? Mine was a 1967 Datsun pickup. I went to the city dump with my dad and we had just finished unloading our junk out of it. He was sweeping the bed out and asked me to move the truck forward a little bit, while he was standing in the back! I don't know what he was thinking because up to that point I had never operated a clutch before. I think I was like 14 or 15 and I had watched him drive plenty of times (dad was a truck driver) but watching and doing are two completely different things. I remember stalling the engine out a few times before he patiently instructed me on how to slip the clutch. I managed to creep the truck forward without knocking him off of his feet so I guess I was successful. After I turned 16 and got my driver's license he taught me how to drive a big rig. Talk about confusing, my first time behind the wheel was in an old Mack with a Triplex transmission which included a twin stick Brownie box. My father was a master at driving and shifting these mechanical marvels and it is an experience I will never forget. Every car has a story, does yours? 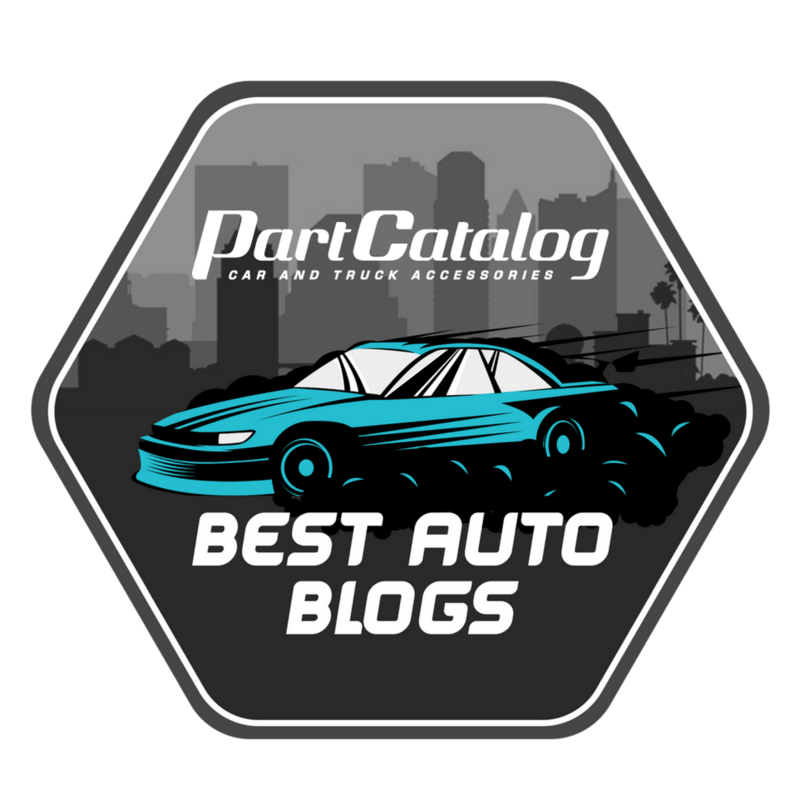 File this under more interesting mail stuff as I just recently received word via email that my blog made the TOP 5 on Part Catalog's list of the 85 Best Auto Blogs to Follow in 2018. How sweet is that? I am in some pretty good company from what I saw on their list and I owe it all to my loyal readers, who stick with me through thick and thin, even though it's been pretty thin lately. Thanks! A lot can be said about opinions as everyone usually has one. Good or bad, opinions are generally received with apprehensive anticipation. There is a famous quote about opinions that compare them to a certain part of the body that I won't quote here, as I am pretty sure everyone has heard it already. A more mellow quote comes from the move The Big Lebowski, when The Dude says: "Yea, well, you know that's just like, ah, your opinion man." Taking my cue from El Duderino, that is usually my reaction when I hear opinions, but when you are getting the same opinion from numerous, different sources, it makes a person start to think. To sum it up, I have been doing a lot of thinking lately. I received a text message the other day from a life long friend that I had not heard from in awhile. He knows that I have always wanted to write for a magazine but with the ever increasing popularity of the internet, that possibility seemed almost impossible. The mainstream thinking was that print was dead, but is it really? He reignited a spark in me that had be dormant for quite some time. Basically, he was wondering when my column was going to start. Heck, I have been wondering that for a long time but when you see the words "I like your writing", it really starts to sink in. Your friends are probably few and far between so they should be treated like gems. Recently, I was fortunate enough to find a new friend in my old age, which is not an easy task given my ultra private life that I usually refuse to let anyone into. My new friend surprised me by saying that my writing was amazing or something to that effect.What a great compliment! Both of these recent comments, and others that I have received, really made me sit back and think about what I write about and my blog in general. Do I really have what it takes? Writing is my passion, and I think it probably shows, but does it really? If I can trust anybody's opinion, it would be my friends. Until the day I see one of my stories in print, I will just have to be satisfied with posting my stories here on my blog. Isn't the interweb great? I have so much to write about but life is getting in the way. Upcoming will be the first chapters of a book that I am writing titled North Main. There will also be a major update on my '56 Chevy project car, Time Warp. Keep the faith and keep reading! A major incident happened recently that jarred me to my core. After the initial shock faded a bit and I could start thinking clearly again, an idea, or maybe more appropriately a necessity, took hold in my mind. What follows is a bit off-subject for this blog, but I believe it should be said and also read by as many as possible. I can start by telling you what did not happen. Death, death did not happen. As we all know there are fates worse then death, such as total paralysis, strokes, Alzheimer's disease, etc. Perhaps Ralph Waldo Emerson said it best: "Of all the ways to lose a person, death is the kindest." The fate known as stroke came in the early morning hours one Sunday and tragically struck down my mother. The cold shock of discovering her, many hours later, haunts my mind constantly and makes my conscience prefix every thought with "what if". Life goes on and so must mine, but time, usually the healer of wounds, is the enemy here. Major incidents happen every day in people's lives, life changing events that force us to see a side of life that most don't like to think about. Most folks think that these type of incidents will not happen to them, some are in denial, and others obtuse. The fact of the matter is that this can happen and may even happen to you, yes you! Nobody is exempt by choice, only by fate. Aside from estate planning, funeral directives, living trusts, wills, power of attorney, and the such, there is an often overlooked area in your life that usually only one person knows about - you! The area that I'm referring to is the day to day stuff, or the things in your daily life, hence the title My Book of Life. My Book of Life, aka Your Book of Life, is a fairly simple idea that will fill in the gaps and could answer many questions should something major happen to you. Personally I am thinking of using a 3x5 note book, because I am old school (or maybe this blog, gee what a concept), but a journal works just as well. Already have a diary or daily planner that you use? Perfect. Notations in your "book" can vary widely but in my case will include updates on projects I am working on, as well as what I want done with certain stuff. It can also contain directions or hints on where to find certain things that only you may know about. This can also be accomplished with a simple check list. On my project cars I always start with making a check list of things that need to be done and then cross them off as I do them. On my current project, Time Warp, that list was pretty long so someone discovering that half of it has been checked off can be a big deal. Not into writing? Talk to someone. Let them know what's up and what your plans are. If I was to leave this life tomorrow or become permanently incapacitated, my family wouldn't know that I had just finished buttoning up the top end on my '56 Chevy and got it running again. That makes a huge difference if they had to sell it to pay medical bills, etc. They would not know what to do with my massive model train collection, what it's worth, or what is broken and what just got repaired. I know that it is common practice to list personal items in Living Trusts and Wills, but most folks don't have either and even if you do, unless you constantly update them there will be many questionable items. Information can be as simple as pointing them in the right direction to providing step by step instructions. Your Book of Life is a perfect way to communicate what is happening, what has happened, and what you want to happen. Of course there is no guarantee that your wishes will be followed but at least you have communicated them and let them be known. Nobody knows when something tragic is going to happen, but when it does it is always sudden and usually without warning, leaving your loved ones in the dark about a lot of things. Shed some light on that darkness with your own Book of Life, you won't regret it and neither will your significant others. I Forgot My Anniversary, But I'm Not In Trouble! I totally forgot my anniversary! Which anniversary you ask? My web page! Ten years ago I decided to put all my automotive experience and thoughts swimming around in my head on the world wide web. Back then I was quite the novice with the interweb as some of my early posts clearly show, especially my first one. Oh well, live and learn. The internet has changed dramatically in ten years but the Amberlight Garage has remained status quo for all intents and purposes. I hope to keep it going for another ten years or more, God willing. For those who don't know the story I will indulge your curiosity. 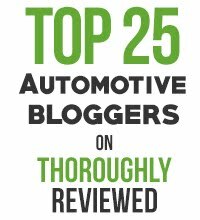 I have always wanted to be an automotive journalist. I love writing about cars and mechanical things in general. When I graduated high school the internet had not been thought of yet so print was still alive and doing well. Back then, in order to land a gig at a automotive publication you needed one of two things: a college degree, experience, or preferably both . At that point in my life I had only a few years of experience and was not a fan of higher education, so I had to seek employment elsewhere. Fast forward 26 years to the year 2008. 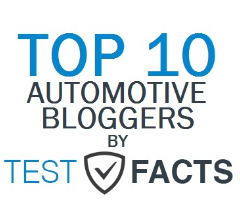 With a lot of automotive experience, ample speciality schooling, and just living life under my belt I felt I was finally ready to seek out a career as an automotive journalist. I soon realized that I was missing one crucial element, writing experience. So with nothing more then a basic computer course and a head full of stories, I set out to create my very own web page. 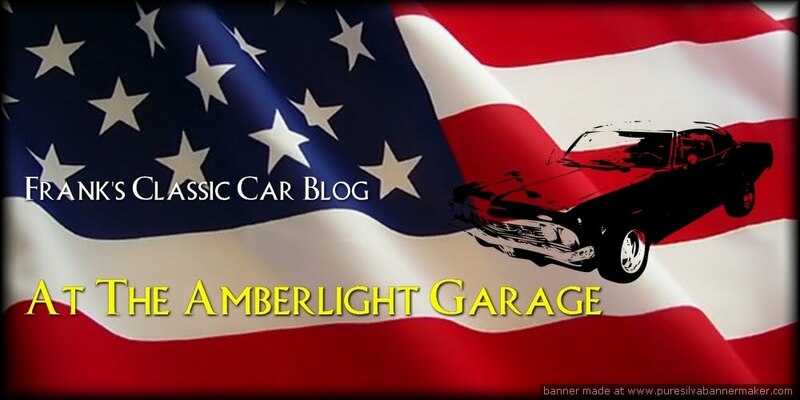 Blogging was all the rage so that's the format I chose, a la Frank's Classic Car Blog.The "hosting" page for my blog is the Amberlight Garage, which by the way is an actual garage that works on classic cars for exclusive clientele. (me) Forget about getting your classic worked on there, the waiting list is over 10 years long! Most folks don't know it but the Amberlight Garage was actually named after the middle light in a traffic signal. Yea, that's not yellow, it's amber. Early on I thought opportunity came knocking for a automotive writing gig but fate had a different plan. I always try and listen to my gut when it comes to major decisions and the choice I made here was spot on. As we now all know, Popular Hot Rodding magazine (which was the "major publication" referred to in my story) went the way of the Dodo bird and most if not all print magazines are switching to online content, some exclusively. Is print dead? It might be dying a slow death but writing is alive and kicking, thanks to all you readers. So here I am, present day, still blogging along and still hoping to land a writing gig and get my first article published, dare I say it, in print. I know someday it will happen, probably when I retire from my real job, and that's only six years away! I think I will put it on my bucket list, right between "attend Viva Las Vegas" and "move the hell out of California". In the meantime I'll be looking forward to my next anniversary, so stay tuned for plenty of cool content in-between. FranktoidTM No. 18 - Carma With a "C"
Regular readers of this blog will recall when I wrote about selling one of my project cars. Well, writing and actually doing are two completely different things so I thought I would put my future money where my mouth is, or more accurately, was. The decision to sell was a tough one with each project car having it's pros and cons. For a moment or two I thought a flip of the coin would be the deciding factor when all of a sudden the solution came to me. I would list the car for sale at a price that was, in my opinion, a little high. If it sold, great! I would get my investment back and then some so I really couldn't complain. If it didn't sell, oh well, I tried! So I listed the car and Carma came a knocking on the door. It sold. Wait, which car sold? Oops, I guess I sort of left out that portion of this story. 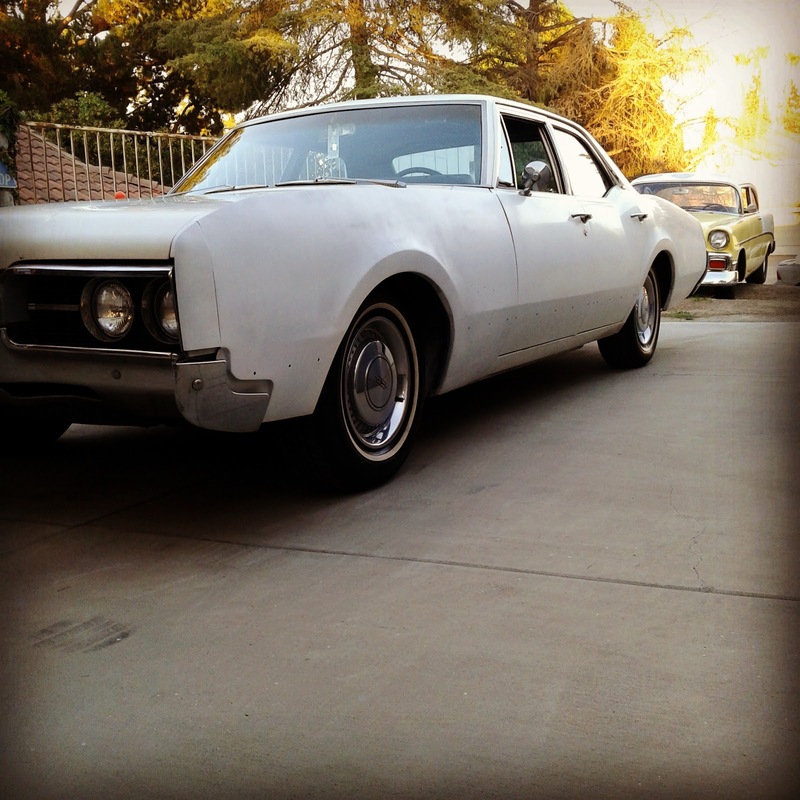 Unable to come to a decision on which project car to sell I decided to sell my daily driver, a 1967 Olds Delmont 88. Part of this decision was based on the need to retire the Olds from daily driver status. The Delmont has been the source for many stories on this blog and has served me well. I really didn't think it would sell, I mean, who wants a 4 door sedan now-a-days? Boy was I wrong. Hello and welcome to my web page. Frank's Classic Car Blog is a combination of repair tips, car related facts, opinions, and some of my photographs thrown in for good measure. 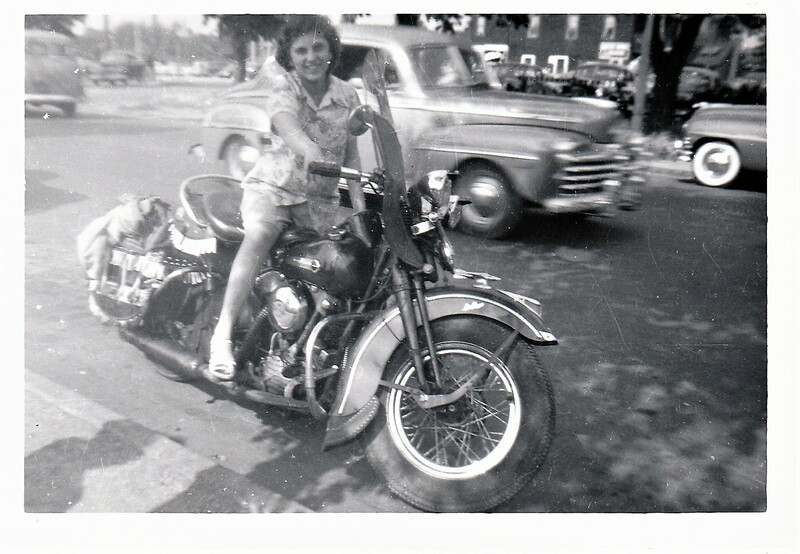 I have been messing with cars and cameras since I was around 14. That's when I got my first car and my first camera - a 1961 Triumph Spitfire and a 35mm Argus. So you might say I have had my share of "hands-on" experience with both hobbies. I would like to know what you think, so feel free to post your comments. Have You Driven a Ford... Lately? FranktoidTM No. 5 - America: Made in China?